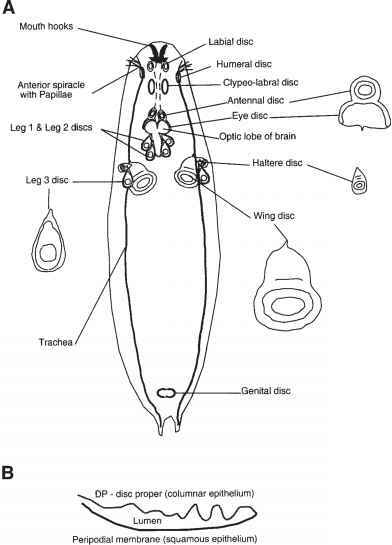 The imaginal discs of Drosophila melanogaster are saclike clusters of cells that generate the epidermal structures of the adult head, thorax, and external genitalia during metamorphosis. Imaginal disc precursor cells are segregated from larval cells during embryogenesis and follow an autonomous developmental program within the larva (1-4). They divide extensively while undergoing pattern formation and cell determination but retain their sac-like shape through the third instar (5,6). The approximate location of the 19 imaginal discs in the third instar larva are shown in Fig. 1A. A schematic cross section of a typical disc with squamous epithelial cells on one side and columnar epithelial cells on the other is shown in Fig. 1B. During metamorphosis in the pupa, the sac everts and the columnar epithelial cells form the eyes, antennae, wings, halteres, and other adult epidermal structures (6). For excellent reviews of work on imaginal discs prior to 1993, see ref. 8, and for more recent work, see a new book (9) with emphasis on pattern formation. is crucial to disc development. These studies have begun to elucidate the mechanisms of long-distance signaling (17,20-23). Imaginal discs are anatomically simple enough to examine by light microscopy without sectioning. Two methods are commonly used to identify cell components for observation. Enzymatic detection is very sensitive and inexpensive and can be used with a simple light microscope. An enzyme is localized by adding its soluble substrate that precipitates and leaves an insoluble colored product at the enzyme site. For example, the most commonly used reporter for gene expression is P-galactosidase, detected with X-gal. Enzyme-labeled antibodies can be used to detect any antigen. The enzymes usually employed as labels are horseradish peroxidase (HRP) detected with 3,3'-diaminobenzidine (DAB), and alkaline phosphatase detected with 5-bromo-4-chloro-3-indolyl phosphate (BCIP)/nitro blue tetrazolium (NBT). For a discussion of enzymatic detection and protocols see refs. 24 and 25; for fly-specific protocols, see refs. 26 and 27. The other technique, labeling of cell components with fluorescent tags, is more flexible and fluorescence microscopy provides better resolution. The protocols in this chapter are for immunofluorescent multiple labeling. 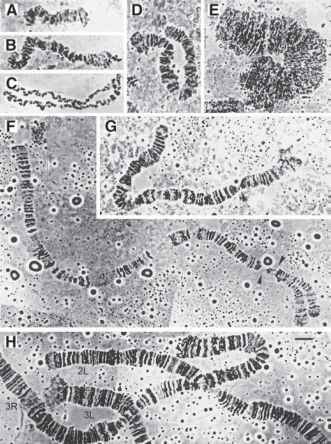 Electron microscopy requires entirely different fixation and staining protocols. The first step is to stabilize the discs by fixation. Fixation preserves the physical structure of tissue and prevents digestion by enzymes or bacteria. The process of fixation is complex and not well understood. Some fixatives stabilize tissue by precipitating and clumping proteins (e.g., ethanol, methanol), whereas other crosslink proteins (e.g., formaldehyde, glutaraldehyde) and trap associated components. Artifacts of fixation include changes in the volume of tissues, extraction of proteins, lipids, and nucleic acids, and chemical modification of proteins, which can affect the interaction of antibody and antigen (28-30). Any fixation protocol is a compromise: Physical structure is preserved better with a hard fix, but staining is better with a light fix that does not affect antigenicity or preclude antibody access. For light microscopy, the usual approach, adopted in this chapter, is to crosslink proteins with a light formaldehyde fix and allow stain/antibody access by permeabilizing cell membranes with detergent. If an antigen is modified by aldehyde fixation, there are various alternatives such as antigen retrieval (essentially undoing some the crosslinks by microwaving or with proteases) or the use of nonaldehyde fixatives (25). Ultimately, finding the best fixation for a given antigen is an empirical procedure. For an example of modifications required for visualizing microtubules in discs, see ref. 31. Histology texts and electron microscopy texts are sources of data on fixation procedures. There is an enormous amount of practical information on internet histology forums and other forums. Internet data are unedited personal information, usually without references and with no guarantee of accuracy, but it can be extremely valuable. It is a particularly good way of locating additional sources of information. Once the sample is fixed, the cellular components of interest are labeled for detection. Staining with antibodies is the most common method for attaching fluorescent labels because antibodies can be raised against so many cellular components. Primary antibodies can be labeled (direct detection) or a labeled secondary antibody against the IgG of the primary antibody host can be used to mark the antibody-antigen complex (indirect detection). Direct detection eliminates background staining, by a secondary. For multiple staining it enables the investigator to use antibodies from the same host of the same class and subclass without elaborate blocking, and it eliminates the potential for interactions associated with secondaries. However, direct labeling of an antibody requires sufficient quantity of antibody and time and effort from the investigator for quality control (for protocols, see ref. 24). Convenience and flexibility make indirect detection the usual choice. Affinity-purified secondaries are commercially available for a variety of hosts with a variety of fluorescent tags. Secondary antibodies that have been enzymatically digested into Fab fragments containing only the antigen-binding site, labeled and unlabeled, are commercially available. Using Fab fragments improves tissue penetration and removes the sites on the heavy chain that are often the target of secondaries and that bind cell surface receptors. Therefore, using Fab fragments may reduce crossreaction and cell surface binding. There are nonimmunological fluorescent probes for many components of the cell (e.g., 4',6-diamidine-phenylindole [DAPI] and Hoechst fluorescent dyes that bind DNA). An excellent source of information is the Handbook of Fluorescent Probes and Research Chemicals from Molecular Probes and references therein (32). For a noncommercial reference, see refs. 33 and 34. Many protocols for using nonimmunological fluorescent probes are compatible with antibody-based staining, but harsher protocols may destroy antigens or alter their location or appearance. For example, fluorescence in situ hybridization (FISH) protocols extract cell proteins and denature DNA, so staining after FISH should always be compared with the results of normal staining as a control to see if enough useful information has been retained for each antigen. The protocol in this chapter for immunostaining of whole-mount imaginal discs is a good starting point. It works well with a wide variety of antigens and preserves the fluorescence of green fluorescent protein (GFP). Subheading 4. suggests ways of customizing the protocol for different antigens. Although imaginal discs have only two layers of cells, they have folds and the nuclei are at different levels. This produces a high background level of out-of-focus light, which can be dramatically reduced by using a confocal microscope, or removed computationally by deconvolution. For a short introduction to microscopy, see Sections 9 and 10 of ref. 35 and references therein.